I often get asked the question, what’s the difference between a metal roof and a regular roof, otherwise known as a fibreglass laminate roof? Is one better than the other and if so, why? How much does a metal roof cost to install? To answer these questions, one has to look at many different aspects. Let me explain the PROS and CONS of metal roofing below. If installed properly, a metal roof should last as long as the house does, sealing out water, surviving high winds, and easily shedding snow. Metal is also resistant to fire, mildew, insects, and rot. Warranties vary, but most companies back their products anywhere from 10-50 years. Paint finishes typically have a warranty of 20-30yrs. Because of the material’s light weight, you can save on engineering and building the supporting structure. In fact, if you’re building a house or an addition, you can often downsize or reduce the number of roof support members. Some types of metal roofing materials may be applied over an existing roof without the need for tear-off or additional structural support. Most metal roofing materials come in multiple-sections, typically in 12” 24” or 36” wide panels. An accomplished and ticketed roofing contractor can install these quickly and efficiently. The thing to watch for when getting a metal roof installed is how carefully/correctly the protrusions are flashed. Because metal roof materials are noncombustible, they typically have a Class A fire rating (the most fire-resistant rating). Just be aware that part of a roof’s overall classification depends on materials beneath the surface that could ignite in intense heat, too. Most metal roofing materials can be installed on gently pitched roofs without leaking. Minimum roof pitch typically is 3-in-12 (the roof rises 3 inches for each horizontal foot). Metal roofing is practically impervious to rain and snow because of the way the panels interlock. This is not the case if the roof is installed with exposed fasteners/screws. In addition, dark colours of metal roofing quickly warm up and encourage the snow to melt quickly. Although there are many advantages to a metal roof, there are also a few drawbacks worth mentioning; some of which are of great importance. The BIGGEST drawback to having a metal roof installed is the initial cost. Metal roofing is will cost you A LOT more than a conventional shingle roof. To put that into perspective, consider this: a 2500 sq ft asphalt shingle (fibreglass laminate) roof will cost the homeowner somewhere between $7250-$8500 depending on the make up of the roof including how many facets, valleys, skylights/chimneys and the pitch of the roof, etc. That’s SAME ROOF done in metal, with a hidden fastener system (the only way you’d ever want to get a metal roof done) would cost a minimum of $27,500-$32,500. Most homeowners opt for the laminate roof because they’d rather keep the extra money in their bank, put another laminate roof on again in 20+ years time, and still be ahead of the game. It’s just not practical; especially in this climate where we get very little snow. That’s why you see very little metal roofing in Maple Ridge or adjacent areas of the Lower Mainland. Because of the material’s long-term durability, the idea is that you ultimately save the difference, if you stay in the house for a long time. Then again, if you plan to move at all, you probably won’t get the return on your investment. For some, the sound of rain tapping on the roof is soothing. For others, it’s like living inside a drum. In a rainstorm or hailstorm, living beneath thin sheets of metal can drive some people bonkers. Noise can be controlled both by using materials that have structural barriers to minimize the drumming effect and by applying them over sound-deadening insulation and solid plywood sheathing. This all helps but it doesn’t do the job completely. Just as your car will dent if a golf ball hits it, a metal roof can dent as well. Though you shouldn’t have to walk on a roof that doesn’t leak, there may be occasions when a plumber needs to snake out a vent pipe or a chimney sweep needs access to the flue. You can walk on some metal roofs but not all of them. This depends on how the particular product is made and the type of construction supporting it. As you might imagine, metal can be very slippery when wet. A metal roof must be installed correctly. Roofs with exposed fasteners are particularly vulnerable to improper installation. Try to avoid this type of roof installation, at all costs. 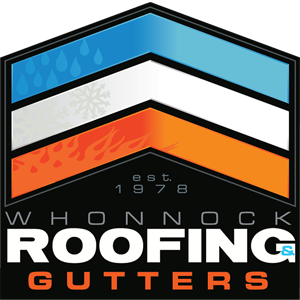 If screws attach through the flat surfaces (rather than the raised ridges), rain water can run down the roof and seep into the screw holes. For this reason, special resilient washes must seal around screw heads. Eventually the rubber washers that seal these exposed screws/fasteners will break down from the UV rays and will need to be replaced. Typically they will last 10-15 yrs before that needs to be addressed. If you install this type of roof, be sure manufacturer’s instructions are followed precisely. Because metal expands and contracts as it warms and cools, most new products have fastening systems that accommodate movement. Otherwise, fasteners that secure the metal roofing may tend to come loose. Expansion and contraction on hot days can cause a wavy affect. Metal roofing materials installed in large panels are more difficult to replace if damaged than individual shingles. Also, if you remodel or add on to your home 10 or 20 years from now, it may be difficult to match the material type and colour and the dye lots and flashing details can vary, over the years. Lastly, keep in mind that, as good as metal roofing is, if it’s not installed correctly, it will fail much sooner than expected. A metal roof, when installed correctly, and with a hidden fastener system is almost bomb proof. However, if the workmanship isn’t up to code you will end up wasting a lot of your hard earned money! Make sure that whomever ends up doing your metal roof in Maple Ridge, or Fiberglass laminate shingle roof in the Port Coquitlam area, that the company has ticketed/red seal roofers on their staff. At least you will have the confidence knowing that you are in good hands with your roof replacement needs.